Good Morning Friends! I hope that you have recovered nicely from the long weekend, but if you’re anything like me it’s going to be a 3 cup of coffee day (at a minimum). To ease the pain, I have such an exciting post for you today! 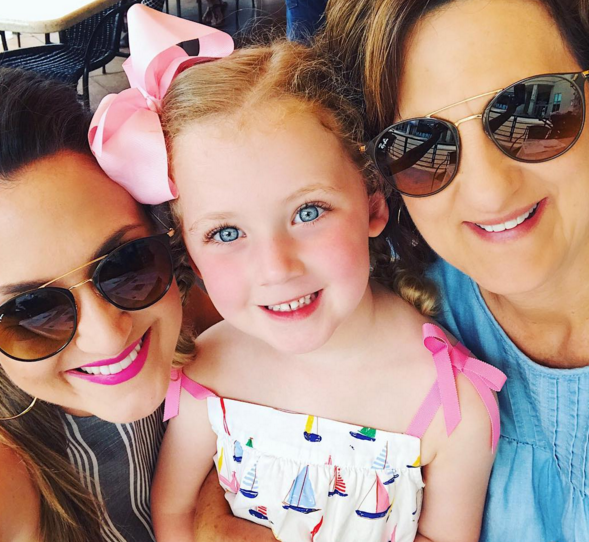 My sweet friend Jennifer from Dimples and Tangles asked me to join her in a “5 Favorites” post and this month it’s all about our 5 Favorite Summer Accessories! When your blogger idols ask you to be a part of their series…you jump up and down, and do a major happy dance! The hosts of 5 Favorites are truly some of the most talented bloggers out there and are all women that I look up to immensely. Their homes are all over Pinterest, have graced the pages of every magazine you can imagine and they just ooze inspiration…and they are so kind to boot! Let me introduce them to you…although I’m betting that many of you follow them anyway…. Jennifer | Dimples and Tangles: Jen- have I ever told you that I have this post book marked for you from 2012??? 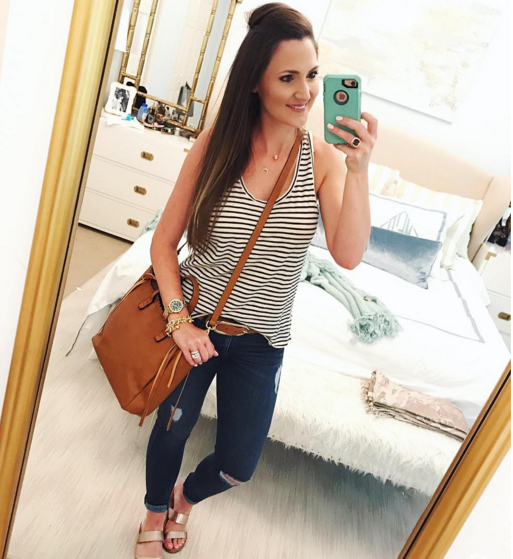 It’s when I started following her blog and I’ve loved every minute of it since! Jennifer has a knack for pattern mixing, bold colors and her use of buffalo check and emerald green always make my heart skip a beat! To top it off she’s one of the most kind people I’ve ever met! Pam | Simple Details: Pam’s Colorado abode is one of my absolute favorites! I discovered her in 2013 during my first One Room Challenge and was blown away by her completed space. She knows how to mix in killer Craigslist finds to her spaces to make them look super upscale and chic. It’s almost impossible for me to pick a favorite space of hers, so just see her whole Summer Home Tour HERE. Lisa | Shine Your Light: Another gorgeous home that’s all over Pinterest! I adore the way Lisa has a gorgeous neutral aesthetic and mixes in rich textures to make her home so warm and welcoming! My favorite post is Lisa’s is THIS ONE where she literally gives you step by step instructions on how to use and install a seagrass runner on your stairs. I have this one pinned from years back and am dying to use it! Kris | Driven by Decor: Y’all everything this sweet gal touches turns to gold. I swear there hasn’t been one project, one table scape, or one DIY that she’s posted where I’m not absolutely drooling. Her house is STUNNING and I’m sure that you’ve seen her designs all over Instagram! Set aside a few minutes, kick off your shoes and take a look around her HOME TOUR. Swoon! So I could fan-girl over these ladies all day long, but they might start to think I’m a stalker, so I guess we should move on! If you are new here, you can take a tour of our home HERE and you can get a glimpse of our everyday shenanigans HERE on Instagram. Style Your Senses is a Life + Style blog with a focus on fashion, decor and DIY. 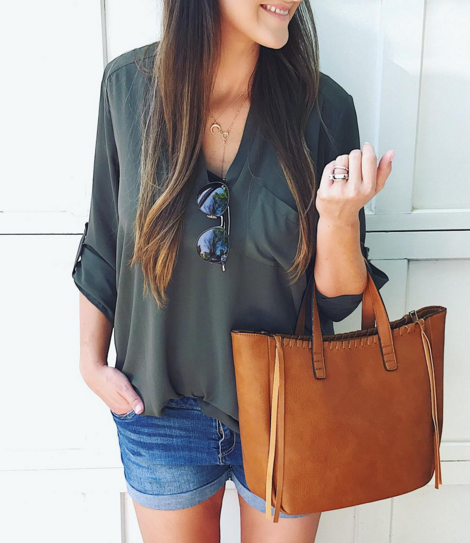 I set out to prove that living a stylish lifestyle doesn’t have to cost a fortune, I love suggesting clothing and styling tips that might boost a woman’s confidence and overall I really like to keep the conversation casual and fun over here on my little piece of the web. If you want to get to know me a little better, read THIS! Thanks for being here…I hope that you’ll come back and visit! If you’ve made it this far, I’m proud of you! ha! 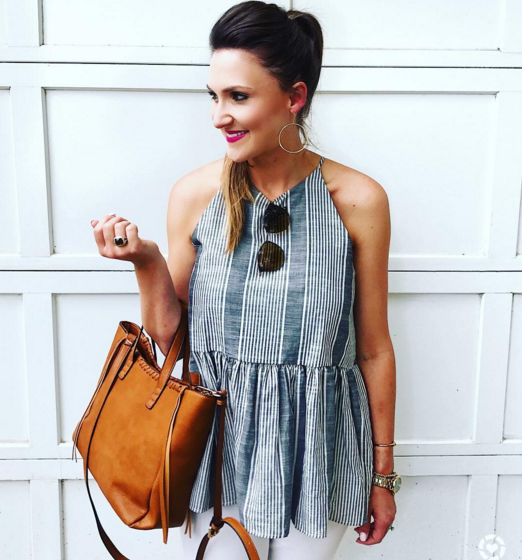 Drumroll please…here are my 5 Favorite Summer Accessories! Slides are definitely the “IT” shoe for the Summer and I could not be more excited. I’m normally trying to put my shoes on with a baby in one arm, so being able to just slip these on and head out of the door (all the while feels super stylish) has been a win-win for me! It’s a very close race between the pearl and the gold pair below, but the pearl pair win as a favorite by just a hair…although I probably wear the gold more. 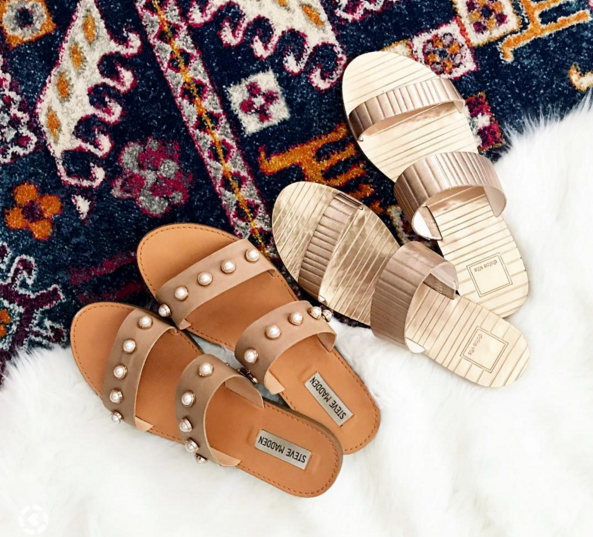 If you don’t have a pair of jazzed up slides…definitely consider snagging some! So I’m throwing a home decor accessory into the mix, because we do love to entertain and eat al fresco in the Summer and I’ve been loving Mac-Kenzie Childs everything lately. I started my collection with the Courtly Check and have loved building out upon it and even adding patterns that coordinate with it to mix things up! 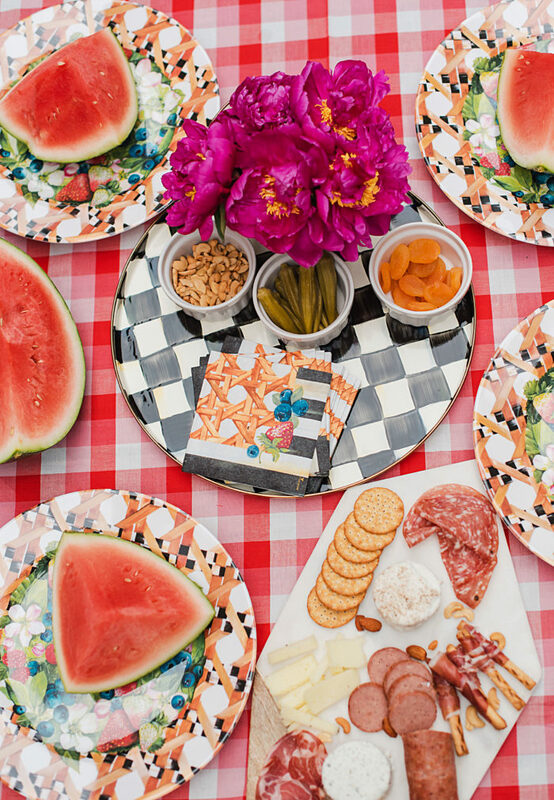 This platter has probably gotten the most use this Summer and when I’m not using it for entertaining, it makes an amazing styling piece in my kitchen! This little tablescape will be part of a fun post with Mac-Kenzie Childs in the coming weeks, so I hope that you come back for it! You guys, I’m not sure that I ever met a statement earring that I didn’t love. See below. Eeek. 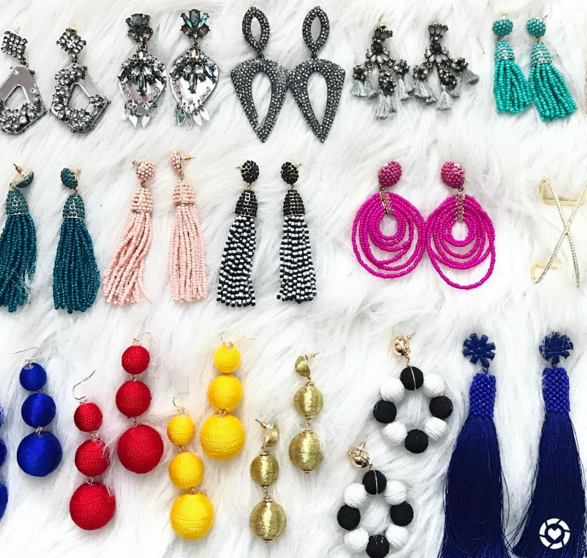 I’m so so glad that they are really trending for Summer because I love pulling my hair back in the warmer weather and really letting my earrings shine. 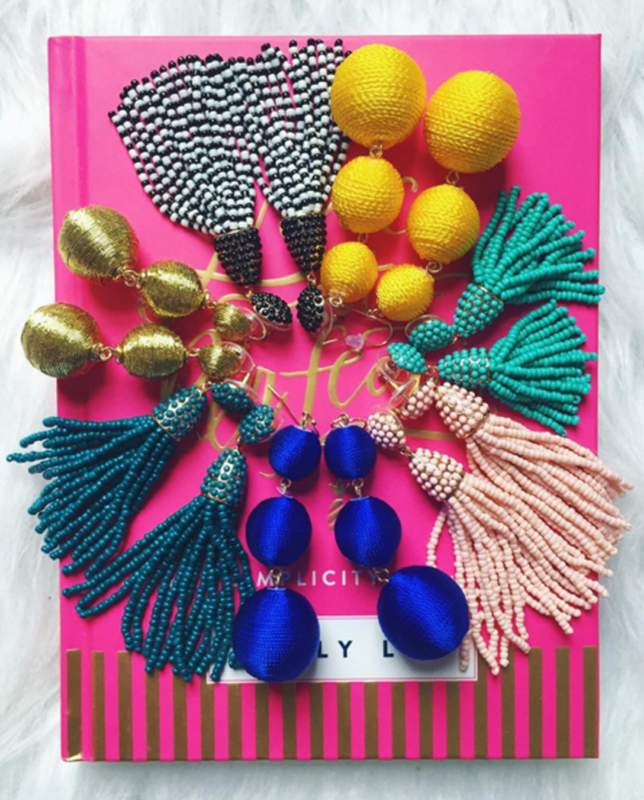 I’m loving all things tassel and really really into the big bubble earrings! 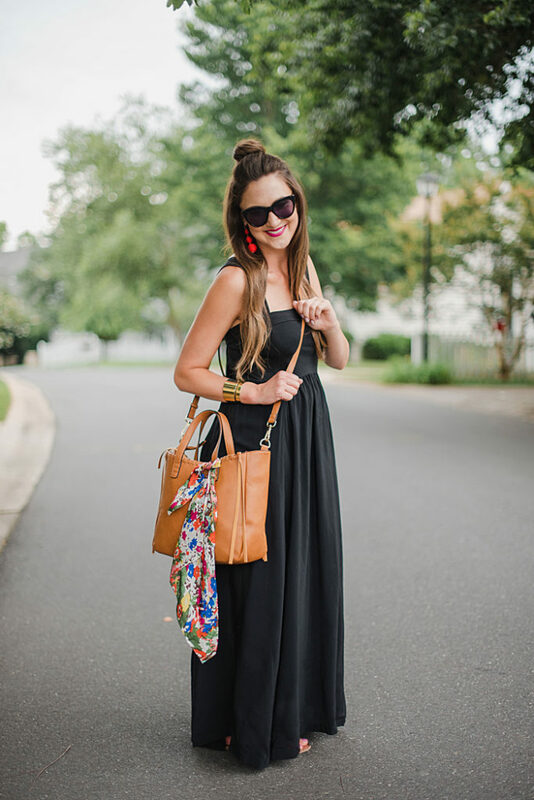 I’m actually wearing 4 out of my 5 favorites here in one outfit…earrings, bag, sunnies and slides! I’m usually a classic aviator girl when it comes to sunglasses. I’ll buy cheaper trendy pair, but anything over $100 and I’m likely buying a trusty Ray-Ban Aviator. This Spring I decided to switch it up and have been really really loving these Brow Bar Ray-Bans. 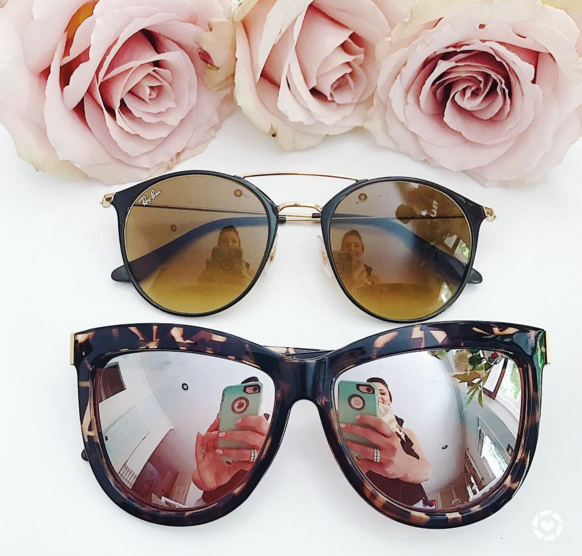 They are still flattering on face shapes like mine and are a great pair of sunglasses for everyday…although the gold makes them easy to dress up too. My mom liked them so much that she bought herself a pair too! If you’re not in the market to make a commitment to the Ray-Ban pair, here are a $12 dupe that you can buy to try out the style. 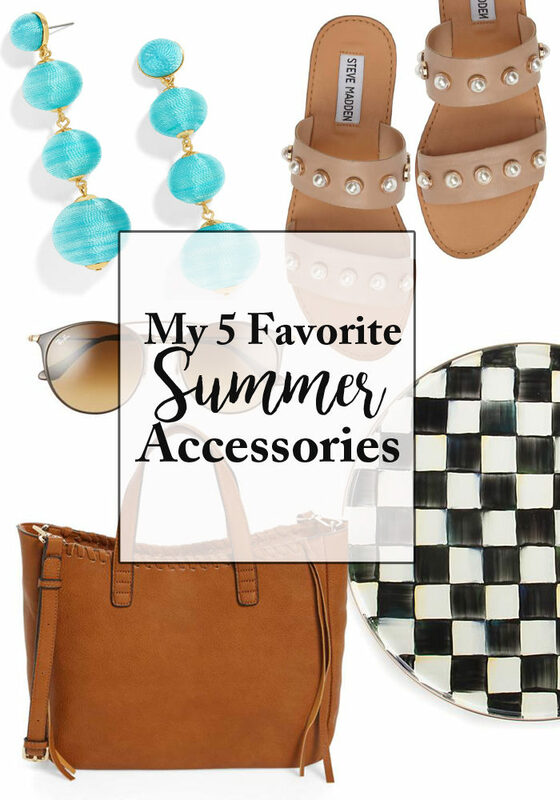 So, there you have it my 5 Favorite Summer Accessories! What are you guys loving this summer?? Would love to hear! Also, if you’re new…I’d love for you to subscribe to my email list and stay in the know! Sign up HERE. You can also follow along on Instagram HERE. 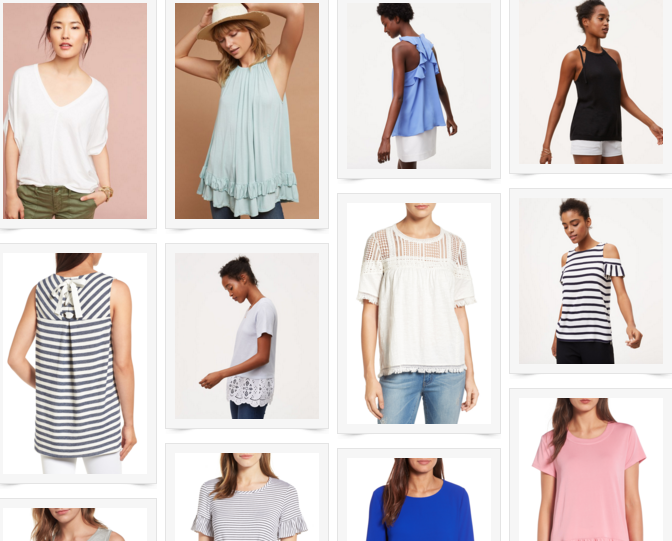 Next week the big Nordstrom Anniversary Sale kicks off!!!! Do you have a game plan? If not, see last week’s post all about my best tips HERE. I just loaded up my cart from your post! 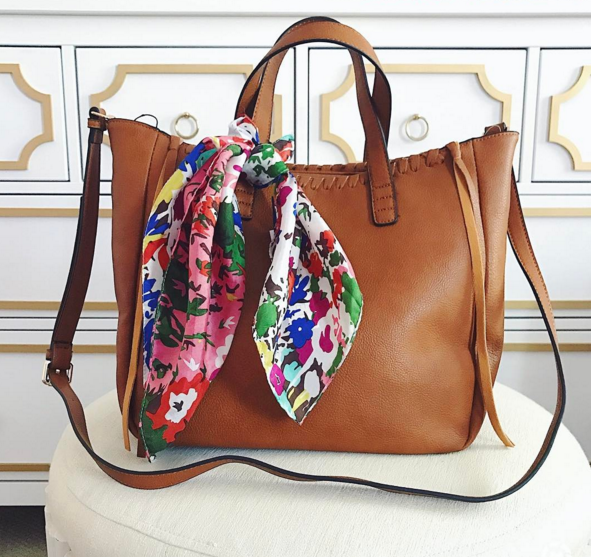 I can’t tell you how many times I’ve thought about buying that bag from your recommendation, and the sale just sealed the deal! 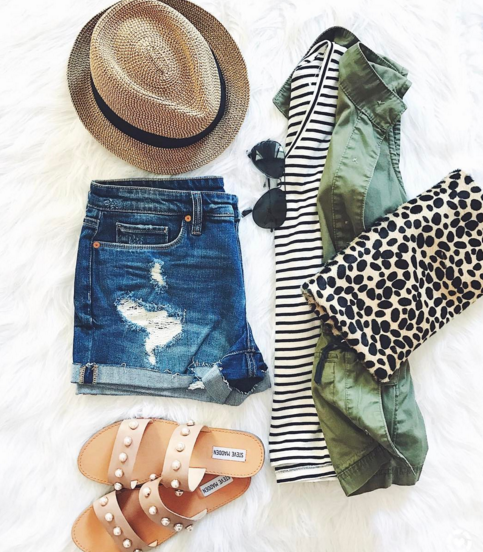 So excited to see your picks for the NSale! I can’t believe you have that ooolllld post saved…yikes!! I’m loving the finished result, though! Thank you so much for your kind comments, sweet friend, and for hosting with us today! I love everything you chose!